 An instant replay of the trial of four suburban New Jersey high school athletes who sexually assaulted a retarded girl with a bat and broom. Laufer (Nightmare Abroad: Stories of Americans Imprisoned in Foreign Lands, 1993) quotes long stretches of the court record as he presents the Glen Ridge case in all of its made-for-TV depravity: the pathetically malleable victim, incapable of saying no; the rich, handsome football heroes who conspired to torture her; the sleazy, inept defense attorney who actually argued that ``boys will be boys.'' Laufer knows how to keep the reader riveted to the courtroom drama, although he overdoes the you-are-there verisimilitude (`` `Please bring the jury out,' ordered Judge Cohen''). 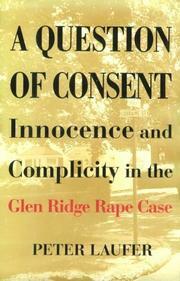 But the book suffers from his tendency to substitute dead-end moral judgments for legal analysis: The ``Glen Ridge story...is certainly about consent [but] mostly it is about four evil, misguided criminals.'' Interviews with some trial observers and participants yield more subtle insights, but Laufer has a way- -ironic in this context--of merely quoting their sometimes rambling thoughts while confining his own analysis to their physical appearance. For example, he undercuts a NOW organizer's critique of the case with comments about her makeup and jewelry, and he describes a female prosecutor who grants him a post-trial interview as ``periodically pull[ing] on the hem of her long dress as it rides up her leg, exposing her slip.'' One of the most challenging questions of the case--whether the ``Glen Ridge rapists would be serving long prison sentences if they were not rich white kids''-- is raised but barely pursued. Best for the brisk editing of a shocking court transcript; otherwise, superficial and melodramatic. Court TV does it better.